In the shadow of the gems of Oxford’s Old Schools Quad, Wren’s Sheldonian and Hawksmoor’s Clarendon Building, Giles Gilbert Scott’s 1930s extension to the Bodleian Library was not only a latecomer to the architectural party, it seems it was an unwelcome one. Architectural historian Howard Colvin claimed the hybrid neo-classical/Art Deco building – a stone’s throw from Radcliffe Camera and claiming an acre of Broad Street’s east end – had turned up to a dinner party in a jacket made of Harris Tweed; with at best, one contemporary critic likening it to a municipal swimming pool. To add insult to injury, when finally officially opened by King George VI in 1946, a silver key that Scott personally designed for the ceremonial entrance on the east corner broke off in the lock. The powers that be at Oxford were apparently so mortified by the incident they never used it – but not before naming it the ‘George VI Door’ and duly cataloguing the offending article as a kind of OCD testament to hubris. What had been key however was the new library’s necessity. In 1925 Bodleian ­librarian ­Sir Arthur Cowley warned that within 10 years it would run out of space, precipitating Scott’s 1934 design for a tight 11 ­storey book stack, able to hold up to five million volumes, discreetly set back within a generous three ­storey wrap of reading room and administrative spaces. In spite of its rickety subterranean conveyor linking it to the Old Library and Radcliffe Camera, it served the university adequately in the interim. That’s until, with its status as a UK library of record and receiving tax breaks and funding to be so, it became subject to an increasingly nervous realisation from the National Archives at Kew that the Magna Carta might in fact be sitting in a non-fire-rated, multi-storey tinderbox. A 2006 competition sought a long-term ­solution, eventually won by Wilkinson Eyre. Wilkinson Eyre’s library, cleverly reinvented in a new guise within the steel cage of Gilbert Scott’s original building, solved all those surplus storage problems admirably – but not without some lateral thinking from the university by way of logistics. For this particular bird to sing, it took a £26 million facility by Scott Brownrigg – who designed an eight million book storage facility on nearby Swindon’s markedly less plumed fringes. This freed Wilkinson Eyre to create a spacious £80 million, state of the art, storage, conservation and research facility for nearly two million of the library’s most important and delicate volumes. In addition to new public galleries and spaces at ground level, the Weston Library not only reinstates 40km of shelf space for on-site expansion – the majority in the three fully upgraded basement levels – but it does so meeting strict environmental guidance. More crucially, it now meets codes on 4-hour fire compartmentation, which in light of last year’s devastating fire at the Glasgow School of Art, can’t have come a moment too soon for the Bodleian’s governing body. The original structure being grade II listed, the new library is something of a palimpsest. Scott’s original three-storey quadrangle of accommodation around the precious book stacks – a dense mesh of steel structure facing its historic context with Bladon rubble dressed with Clipsham stone – was retained. But after the books were decanted, over the course of a year the steel central stack structure was dismantled to be rebuilt with a fit-for-purpose, fully concrete structure holding two new reading rooms, scholars’ centre and ancillary spaces. These are held aloft above the sizeable and publicly accessible ‘Blackwell Hall’ and gallery by two concrete service cores that spring from completely remodelled basement levels. Scott’s strange Art Deco reading room ceiling soffit has been restored and his desks sliced in half, extended and elegantly reassembled. The restored Mackerras reading room. The new architectural interventions might be bold, but it’s the engineering back story to the book stacks that carries this project – with the all-important basement levels taking two years to demolish and reconfigure to create its 21 fire compartments. This meant detailed structural surveys to calculate the amount of slab heave that would be expected when the dead load of the books was removed (about 6mm) and to ascertain the condition of perimeter steel. This revealed, to some consternation, that it was attached to the reinforced concrete lower basement slab by no more than the screed – involving wholesale bolting down of the structure before the new reinforced concrete was even cast around them. Decisions here were based on pragmatics rather than poetics – the trade-off between fire, structure and services demands and the need to retain shelving for all those books – forcing space planning strategies as a function of the concrete encasement around the steels, to optimise their runs. A gas suppression system, necessitating huge ducts to force out air rapidly in the event of fire, was (apart from the Strong Room) dropped in favour of a hair-trigger aspirating fire detection and water mist system that Wilkinson Eyre claims, re-wrote the book on the technology. Two plenum walls at opposite ends of the stacks ensure constant air flows throughout, conditioned to the ideal 18°C and +/-50% relative humidity demanded, with an interstitial drainage layer built-in between old and new slabs to guard against flooding. With the safety and storage of the collection ensured below ground, the spaces above gave the firm the chance to make its own mark on the Bodleian, manifested in three main moves. 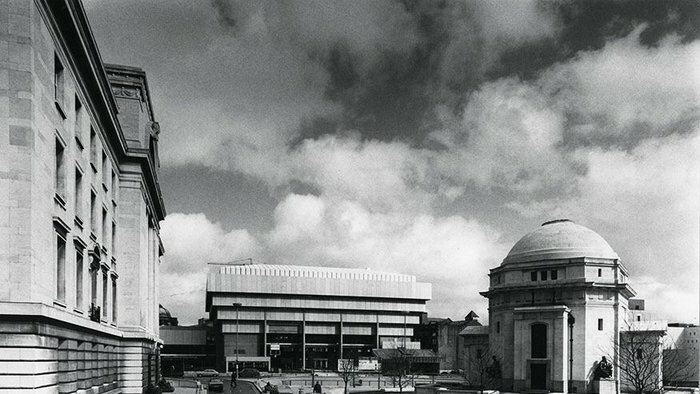 First was the decision to create a recessed south entrance facing out to the architectural triumvirate across Broad St; second, the creation of Blackwell Hall, the university’s largest internal public space at ground floor level, which is facilitated, thirdly, by the jacking-up of the new reading rooms and Visiting Scholar Centre in a floating box set away from Scott’s original perimeter doughnut of spaces. These interventions have a clear logic that prove transformatory for the library, not only opening the hall space up to the site of the traditional convocations to give it urban purpose, but in turning the south-facing Clipsham stone pilasters to columns, creating a colonnade whose depth acts a deferential foil to the classic grouping, mediating between old and new. Around the hall at first floor level, the pièce de résistance is a ring of open access books set seductively behind floor to ceiling glass announcing the purpose of the building which, until now, had never been explicit; above it the floating reading room box. But inspired by SOM’s 1963 Beinecke Rare Books Library at Yale, the gesture falls far short of its jaw-dropping gravitas. With such a tantalising precedent cited, you wonder what plan arrangement might have facilitated the inverted ‘ghost’ imprint of the ‘lost’ book stacks all the way up the internal south face. As it is, the east and west sides of the ring of books bridging the hall feel insubstantial and with nothing above it, result in ­unsatisfactory, left-over spaces. Wilkinson Eyre has however respected Scott’s circulation, catalogue and reading rooms and brought them back to their former glory with a lightness of touch. Externally, the architect’s original aluminium window frames have been retained and restored and remain, even now, as delicate as steel ones. The theme carries through to the detailing of the new reading rooms, duly crafted and bookish, which went through a long process of development with client and users. The firm had a head start: Barber Osgersby had earlier designed a fine bespoke tilting chair in European oak. Counter-pointing the heaviness of the Scott chairs and acting as a spring board from which the architect designed complementing reading desks and lights. With their brass lighting cowls, power point and IT covers, they are well-built and look to be there for the duration. I have reservations over detailing of the public spaces, unsure if the choice of rough cast plaster used in the Blackwell Hall rather than the original alabaster-like Taynton stone was conscious or the result of value engineering in a D&B contract. And the punctures through it that apparently reference former openings into the stacks, in their various guises, feel whimsical and spurious in a building that should be about expressing index and order. The Blackwell Hall looking east. But these are gripes, as the real work was done below stairs; the priceless collection, now respirating calmly in its highly conditioned and fire-rated environment, is safely preserved for posterity – and for that Jim Eyre is a worthy recipient of his Bodley Medal. Special Collections curator Fletcher is also breathing easier in his new conservation labs and, ushering us from one of the yet-to-be-filled basement stacks, drops a casual comment on his past fear of watching ancient manuscripts curl up like crackling before his eyes. ‘The thing about vellum is it doesn’t like going from one kind of environment to another – it’s always trying to return to the shape of the original animal,’ he quips. We all laugh but after eight years penned in behind the skin that Scott built, you’d forgive the architects if they don’t see the funny side.